Here and now, I start my new project: a series of interviews with prominent politicians, businessmen, scholars and public figures on different important problems in international relations, new developments in the world economic and finance system, on technological innovations and their effect on people and society, on the relations between Russia, the West and emerging new global powers, and other interesting subjects. In 2010, Malcolm Rifkind was appointed as Chairman of the Intelligence and Security Committee, a post he held until 2015. In July 2016, he published his book of memoirs, “Power and Pragmatism”, which I highly recommend to those, who is interested in history of world politics of last decades. 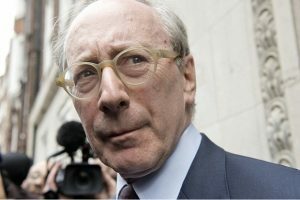 Because of his criticism of Russian action in Crimea and eastern Ukraine Rifkind was included in a list of senior European politicians and former Ministers banned from visiting Russia. In the first part of the interview, we discuss trumpism and Trump phenomena. MR: — I have complete freedom to say whatever I wish to say! VM: — That’s why, taking into consideration you experience, your knowledge and understanding of the world politics and world problems, it will be interesting for the readers to know your opinion on the latest events in the world. Let us start with two important events: election of Donald Trump and Brexit. What do you think about the reasons for the emergence of Trump phenomenon and trumpism? Why did the US, declaring multiculturalism and liberal values and trying to introduce these values in the world, elected Donald Trump? MR: -That’s a very good question and there have been major developments in the United States and elsewhere in the recent past. I think, I would start by reminding readers that the system of government we have in what is called the West, but which is also true in many other countries in Asia, Latin America, and Africa, can best be described as liberal democracy. Not just democracy, but liberal democracy. And, until recently, many of us assumed that liberal democracy was one thing. And what we are seeing is that it is not. It is two quite separate things. So, the fact that we have democratic government, unlike China, unlike Russia, unlike more authoritarian countries, that is not under challenge. The election of President Trump, whether one likes it or dislikes it, was a magnificent expression of the democratic principle, the people of America, the tens of millions, rejected the views of the establishment, of the political leaders and chose the outsider, the person they wanted. And in a similar way, in Brexit, whatever one thinks of the decision to leave the European Union, it was not antidemocratic, quite the opposite. Yet again, millions of people, by a narrow majority, but nevertheless, by a majority, decided they wanted their country to go a different route, to the one they were being advised. So I don’t think there is any weakening of democratic principles as a result of these events, quite the opposite, quite the opposite. People have got irritated, bored and sometimes are angry with their political leaders, and the whole essence of a democratic system is if the government is making serious mistakes, if the government has outlived its usefulness, then the people, they are sovereign, they have the right, it’s not just a symbol, not just a theory, it actually works, it happens, people change their government without a shot being fired, without prisons, a secret police or matters of that kind. VM: — But what are the reasons for this? What is behind trumpism? MR: — I’m just coming to that. As I said, we’re a liberal democracy, and the democracy is as strong as ever. The liberal aspect of the way we have governed ourselves is linked to democracy, but it is nevertheless distinct. It involves recognition that no country is an island, that all countries depend on alliances, on friendships, on working internationally, that is more true in the modern world than in the past. It depends on the degree of toleration for minorities, that majority just by being a majority can not do whatever it likes. In a healthy society, it tries to respect, to find compromises with a minority. It does not insult people on grounds of religion or race or gender, and issues of that kind. And that is all a part of the much more globalized world we are living in. People understand globalization, but of course there are losers as well as winners. And what we have seen in the United States and to some degree in the United Kingdom, is a significant feeling by a large number of people that they are not as comfortable with multiculturalism, with respect for minorities, with international solutions to problems. And they hark back to more comfortable national sovereignty solutions. So, that is not just an American phenomenon, we are seeing everything of that throughout the world, but it is, I come back to the point, it is within the context of a democratic society, this is not a questioning of democracy. It is a questioning of how democratic leaders have used some of their powers in the past. VM: — Asking this question, I didn’t mean to put under question mark democracy and democratic values. I think that it is important to understand the reasons that made majority of the population in the US to be unhappy with the present situation in the country. According to the opinion polls carried out just before the elections, from 60 to 70% of the Americans were unhappy with economic and political situation, with their life. What are the reasons for this? MR: — Right, I think the reasons are economic and social impact of some of the consequences of globalization by which I mean, for example, a huge increase of migration, people wishing to move and live in another countries. There have always been big differences in wealth between some countries and other countries in the world, but in the past there was no practical way a person living in a poor country could expect simply to migrate to a wealthier one, unless it was a country like the United States that was actively looking for migrants in order to build up their population. So what we have seen is a lot of migration, but it is not just a migration of people with similar cultural and religious and social background. It is people from very different cultures. Not just Muslims, but also Hindu, or Buddhists or whatever, and that can sometimes create strains. And we have seen in Europe and to some degree in North America the indigenous community has found it difficult to accept not the principles of migration but the numbers involved. That cannot be separated, sadly, from the more recent problem of jihad and Islamic terrorism, where a tiny minority of people of Muslim background have been active terrorists, killing people, including themselves, in pursuit of their ideological objectives, and doing that in Western countries, not just in the countries from which they originally came. And that has created an additional dimension of controversy. On top of that you have the consequences of global free trade, and the belief fostered by Mr. Trump, greatly exaggerated by Mr. Trump, as if somehow all the problems of unemployment or of low incomes in the United States are due to unfair trade. I think, that is a grossly exaggerated argument, but, nevertheless it has had resonance with many people. MR: — Forgive me. No, he wants to build a wall, very long wall against Mexico precisely because of the huge illegal immigration from Mexico into United States over many years, that is single most important issue of migration. VM: — Yes, but the “wall” was not the main reason for Trump’s victory, for the victory of a man coming from political nowhere, from business to politics, being anti-establishment. He came to Washington and won the elections. MR: — No, no. He thinks, it was a reason, one of the most important reasons, otherwise he would not be making it one of the first announcements as president, that he still wants to build that wall. It is in his authority to do so. VM: — At the same time, there were other important points in his election campaign: economic problems, fall in the industrial production, unemployment. If you go, as he said, from New York to Chicago, you’ll see dead plants and factories all the way. He also spoke about the political elite. The political elite in Washington, for many years, was formed in accordance with a certain model: young politicians immediately from the universities go into politics as assistants to the US Congressmen and party politicians.. They grow up in politics and after years, they become Congressmen themselves, having no experience in business, no experience in the industries or in science, or in services. Speaking about the political elite in Washington Trump stressed that this elite is out of touch, there is a gap between the political elite of Washington, which he tries to remove, and the majority of the Americans, as well as the situation in other countries of the world. The Americans supported him. MR: — But, you say, the majority of Americans. This is not quite correct, because of the electoral college system; Trump has won despite having three million votes less than Hilary Clinton. By their rules, he won the election, and he clearly tapped into the level of resentment, of difficulties. That was not about foreign policy. It was overwhelmingly over domestic issues that were preoccupying people in a number of individual states. But there were key states in winning the number of votes in the American electoral college that determined who would become president. So, what one sees, it is not just an American phenomenon. One sees it in a number of other countries, that when you have a global free trade, a substantial free trade, it does increase the prosperity of the countries dramatically, but not everybody benefits from that. And it does benefit many exporters, many companies, but, of course, when you remove these economic barriers, companies can say that we are going to move our factory to a country which has less costs to make our business more competitive. That might be sensible for that business, but it means people lose their jobs when the factory moves to a new country with cheaper levels of cost structure. VM: — Yes, you are correct, but a lot of discussions are going on about what is trumpism. MR: — People use this word, but it does not mean anything. VM: — There is no specific meaning in this, yet. But there are people, who are working on trumpism as a new ideology. MR: — There is no ideology. Trump has prejudices, he has instincts, he has some policy proposals, but there is no ideology about how the world would be a better place or America would be a better place. It’s not been thought through. He’s never written a book, he’s never made a speech going into detail. It is a series of slogans. VM: — But some of the US think tanks have been working for several years on the problems, which Trump has spoken about during the election campaign, like world trade, export of capitals and production from the US to China, Mexico and other countries. For example, the Center for Strategic and International Studies (CSIS), a bipartisan think tank with scholars that represent varying points of view across the political spectrum. CSIS is labeled a «centrist» think tank and is ranked the number one think tank in the world for «Top Defense and National Security Think Tanks» and as the 4th best or «Think Tanks with the Most Innovative Policy Ideas/Proposals”. Rex Tillerson, now the US Secretary of State, is a trustee of CSIS. Henry Kissinger is its counselor and trustee. In recent years, the CSIS has come up with the idea that America should focus on its problems at home to strengthen its role abroad. This became one of the main ideas of Trump’s campaign. In recent years, the CSIS increased its research focus on international economics and issues concerning the North American Free Trade Agreement, the World Trade Organization, the International Monetary Fund, the World Bank as well as global health and the environmental and social effects of climate change. Trump made CSIS research focus points as the main points of his campaign. Can it be a coincidence? It looks as if the CSIS was one of sources of the movement that pushed Donald Trump into politics and gave birth to trumpism. MR: — Absolutely, I mean, we agree with each other. VM: — I know that scholars and research teams in Great Britain and in the United States are working now on the development of the ideological base for Trump, or better to say for trumpism. MR: — Well, there have always been an element of right-wing politics that would like to do that. A lot of it is based on nostalgia that the past was somehow better than the present. We will have to wait and see. As we are speaking today, there is no Trump ideology. VM: — In the UK and the US, there are groups, and I know personally some of their members, who are working on the new ideology. Some of them call themselves “realists”. In your book, you write about pragmatism in politics. Pragmatism is not realism, but very close to it. Why do these ‘realists’ support Trump and try to develop trumpism? VM: — Well, it depends on terms and conditions of the treaties and agreements. MR: — What I’m saying at the moment is… I could argue that view as a realistic view that will not work. The kind of realists, people, you are describing as realists, are people who think of realism in a different way. And they include Mr. Putin. He sees… I don’t want exaggerate…But the point I’m making is what Trump and Putin have in common is they both think deal making. Bilateral deals between powerful people are how they would solve the problems. Now, they might solve some problems that way. I mean, for example, we are told that Mr. Putin and Mr. Trump are going to meet at a bilateral meeting quite soon. I welcome that. The question is whether it will be healthy or it will be unhealthy. Now, it depends on what is on their agenda. If they are discussing multilateral disarmament of nuclear weapons by agreement, it makes sense that it is just Russia and the United States at the stage, because 90% of the world’s nuclear weapons are Russian or American. And, therefore, if there is to be progress, it is these two countries that matter more than anybody else. That’s realistic. If, on the other hand, they were to meet in order to try and reach a deal on Ukraine, as an example, I would say, is Ukraine going to be sitting around the table? If it’s not sitting around the table, than that it is exactly what happened with the Munich agreement in 1938 when Chamberlain meets Hitler and together they agreed on the dismemberment of Czechoslovakia, and the only people who were not there were the Czechs. Who were told afterwards, here is what we agreed, it’s your job to implement it. Now, that was disastrous in 1938. And if something like that was to happen, I won’t say it will happen, but if that is what the deal is about, that kind of issue, the issue like Ukraine has to be discussed internationally. VM: — I want to say that Ukraine is a very complicated subject and needs separate discussion. MR: — But you can’t have a solution without Ukraine. They are a government, they are an independent country. MR: — No, no, not under control. They have their orientation, but they are as independent as Greece, as Spain, as Italy, as many other countries. MR: — I’ve never said they were. MR: — I’m entirely of that view. You can not have a solution to Ukraine without Russia. Of course, that is true. What I’m saying is that you can’t have a solution to Ukraine without Ukraine. MR: — But we were discussing how significant it is that America now has Trump, Russia has Putin, they seem to like each other, they respect each other. I’m not worried, if they like each other, if they respect each other, that’s good, that’s very good, because if people like each other and respect each other, there is a better chance for agreement. 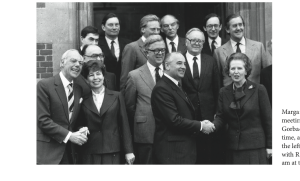 I was present when Margaret Thatcher met Gorbachev. They did not agree with each other, but they ended up liking and respecting each other, and that helped, that contributed towards the ultimate end of the cold war. MR: — What that means, they are both very different people from each other, they are not similar people, but they have something in common. Mister Putin, for geopolitical reasons, wants Russia to be restoring its role that it had during the cold war as one of the two super… There was time in Russia, historically… There is, perhaps, going back, that is fairly common. Mister Trump has no experience in diplomacy, no experience in geopolitics; nevertheless, he has a personality of a very powerful kind. And he is attracted, as is Mr. Putin, with the idea of them two at the meeting, solving the problems of the world. What I’m saying is, on nuclear weapons — good, healthy, right, how it should be. If it’s on Ukraine, if it’s on Syria, if it’s on other issues — disastrous. Because any agreement they might make would collapse if it did not include the other countries that have equally important and in some case, in Ukraine, for example, even more vital interests in the outcome. MR: — Forgive me, the whole point I have to emphasize is that you cannot treat Ukraine as different. It is not different. It is…It has the same rights and the same obligations as any other independent member of the United Nations. And I am not prepared to accept that somehow different rules apply when you’re discussing the future of Ukraine compared to other international issues. VM: — Let us come back to Trump and trumpism. In the UK and the US, there is one more wide spread movement supporting some of the Trump’s ideas, as well as Brexit. Many members of that movement or group called themselves “futurists”. Their point of view is that the world is coming to the stage of technological revolution that will result in tremendous reduction in the demand in the work force. MR: — Possibly. Because of automation. VM: — Automation, robotics, artificial intellect, genetics…. Many professions will be reduced in demand or disappear. VM: — These people supported Brexit and now they support Trump, at least in some points, because they think that states, governments and political elites are to be prepared for the new technological reality. One of the important point is to develop the working places capacity reserve, to provide people with maximum working places before the downfall of labor market starts. At the same time, you need to change the education system, to re-orientate people to more creativity, to new forms of the activities, and to change the social system, to change the structure of the society, to be prepared to use properly or to use with efficiency the potential of the population, of the people, who are to be removed from traditional labor and professions, from the traditional production and services. They see in Brexit and in Trump’s idea of the control over the migration, of closing borders and constructing “the wall”, forcing the US corporations to bring back to the US the production and capitals an attempt to prepare the UK and the US for the new technological revolution. MR: — Right, if these are their views, I think, these are fantasies, because what you’ve referred to in the beginning of your comments, yes, that is a historical process, it won’t just happen overnight, it will not happen this year, next year, the year after. It’s going to take, it will be over a generation. VM: — No, they speak about five to eight years. MR: — They don’t know, they don’t know any more anybody else. The question of automation, robotics, it’s all happening as we speak, and it will affect, it will have economic implications. But the idea that any government can somehow prepare today as if it’s some known specific identifiable risk that you can plan to deal with, you can’t. Nobody knows, even you and I and other people know that yes, we’ve had an industrial revolution for the last two hundred years. This is not some new issue. We’ve had computer technology developing very quickly over the last 30 years. No government 30 years ago could have taken decisions, which you have meant today, we would be perfectly placed to deal with all these issues, because they did not know what was going to happen. They did not know what the pace of these things is. VM: — Or by Brexit! MR: — Or Brexit, yes, of course! Let’s not be diverted for Brexit, forgive me. If you want to know, the single most important reason why a majority of people in Britain voted for Brexit was because they wanted Britain to be as independent as America or Russia. MR: — I think, that it’s very healthy, that people should be discussing, that happens in Britain for many years, it’s not a new phenomenon. That it’s what happens in an open society, we have a free media, so the media is a part of this discussion, on newspapers, on the radio, on the television; they are not controlled by government. All these debates take place, and that is why the West is economically and socially so much superior to authoritarian societies. Because you have that free discussion, you have that free generation of ideas, you have a market system. Even China is distorting its potential, because although it’s gone the capitalist route, it is still state capitalism, where the state still has control of all the major decision affecting the economy, and that prevents the natural generation of new ideas, new methods, new proposals. It all has to be given political approval. You can’t have a realization of all economic potential if politicians have to give their approval to every stage. VM: — So you are coming closer to Trump! MR: — No, in what am I close to Trump? MR: — Trump has become a politician. Trump is a politician. He’s made himself one. He does not have political experience; that is a part of his problem as well as his political attraction, but the point I’m making, yes, in any society you will get people coming up with theories. You cannot change, you should not change the whole country because some individual or a group of people has a marvelous way they think they solve the problems of the world. VM: — What is your view on the future of trumpism? MR: — First, I don’t think there is trumpism. If you are asking me my view on the future of Trump, then he will either, over the next one or two years , he will either evolve into a more conventional politician, he will still be controversial, many are controversial, he will still take decisions a lot of people don’t like, but he will either evolve into someone who is seen to be acting in a rational, thoughtful way, or he will face the risk of impeachment, because the American constitution was written to deal with all the unknown fundamental problems the state might be faced with. And in America, although the president is the most powerful man, he does not have the power of president Putin. He has a Congress, which is, even with the Republicans, is independent of the president, and if they wish they will block what he wants to do. They have a Supreme Court, which, whoever are the judges, will see their first loyalty to defend the Constitution against if anyone trying to become a dictator or an authoritarian. You have a free press, a free media, which will not be bullied by Trump and, therefore, the damage he can do, in my judgment, is more international than national. Because, when you are the president of the United States, you have control of nuclear weapons. When you are the president of the United States, you can tear up a trade treaty, as he has done, you can cause huge political difficulties by seeing the president of Taiwan against the One China policy or by, say, you move the embassy from Tel-Aviv to Jerusalem, I think he acts so. He can do a lot of damage, he may do some good, but he can also make a lot of damage. On the domestic front, Congress, the Supreme Court, the American constitution, the American media will resolve most of the domestic problems.